Moody Gardens wants you to be a reefer starting 4/20. 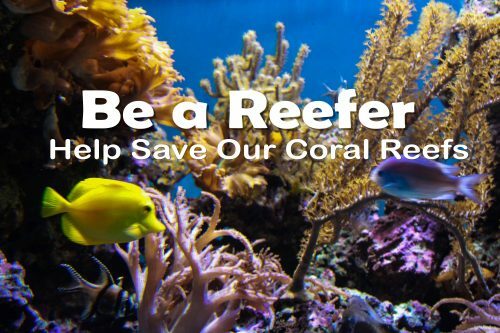 Now that we have your attention, an international effort is underway to increase awareness and combat a disease that is rapidly killing the Florida Reef Tract, the third largest coral reef system in the world. Moody Gardens’ new Coral Rescue Lab will be used to propagate coral as it focuses on species being impacted by this disease. The Association of Zoos and Aquariums (AZA), selected Moody Gardens to participate in this vital project to help save corals native to the Florida Reef Tract as one of 60 institutions from 21 states and Canada. “We are excited and honored to be selected as one of the institutions that are being entrusted with the care of these corals,” said Greg Whittaker, Moody Gardens Animal Husbandry Manager. In 2014, an unidentified coral tissue loss disease was first observed in Miami-Dad County and quickly spread throughout the north areas of the Florida Reef Tract. The disease outbreak continued to persistently spread south of Miami through the Upper and Middle Keys, reaching the Lower Keys by April 2018. In response to the disease the Florida Wildlife Commission (FWC), National Marine Fisheries Service (NMFS), Florida Keys National Marine Sanctuary (FKNMS), and the Florida Department of Environmental Protection (FDEP) have formed the Florida Coral Rescue Team to execute the Florida Coral Rescue Plan to save what is left of Florida’s healthy coral stocks. Part of that plan includes the Rescue Team reaching out to institutions to house and maintain corals for gene banking and propagation for potential future restoration activities. The Rescue Plans has two primary goals: prevent ecological extinction of the most susceptible species along the Florida Reef Tract, and maintain as much genetic diversity as possible among approximately 25 species of coral. “Corals are animals and are highly impacted by their environment. Through this effort we are helping nature respond to a crisis and recover to once again become a healthy ecosystem,” Whittaker said. In March the Aquarium Pyramid received 250 pieces of live aquacultured rock in preparation for the live corals for the exhibit. Aquacultured rock is rock used to season coral aquariums and prepare them for holding local corals. On April 17, Moody Gardens received the coral entrusted to us and acclimated it to its temporary home inside an exhibit inside the Aquarium Pyramid. “We are looking forward to being able to educate our guests about the diversity of Florida’s coral reefs and the importance of maintaining a healthy ecosystem for them to thrive,” Whittaker said, adding that this project fits in perfectly with the cornerstones of Moody Gardens’ mission of conservation, education, rehabilitation and research. The arrival of the live coral into the Aquarium Pyramid appropriately coincides with Earth Day, being celebrated property-wide at Moody Gardens with presentations and crafts on April 20. As part of the Earth Day festivities, the first 100 people starting at 10 a.m. to visit a new Reef Rescue VR Experience will receive two-for-one admission to the attraction. Reef Rescue VR is an interactive high-capacity virtual reality experience where up to 16 people can pilot their own R.O.V.E.R. to help clean up waters, plant new coral branches and feed the fish, returning the reef to complete health in the process. Moody Gardens is a public, non-profit, educational destination utilizing nature in the advancement of rehabilitation, conservation, recreation, and research. New Year’s Day always seems to have an air of renewal even though it’s an artifact of our own making. This year was particularly poignant with a bright sunny morning, calm winds and a comfortable temperature in the high 50s as I did my perimeter birding survey on the familiar route. Something was strikingly different however, as my “410-acre year” had officially ended the day before and I no longer was looking for that last elusive species to boost the property total. I found myself spending more time looking at what the birds were doing, not minding that I didn’t see a Spotted Sandpiper along Offatt’s Bayou, or the Belted Kingfisher on the tower in the marsh. I will be continuing the daily surveys at least through January to create some overlap in the seasonal diversity and provide the abundance data for the eBird listings, since I only included presence/absence with my January 2018 numbers. I found myself being more contemplative on this first unofficial survey. Stopping to notice a secretive Pied-billed Grebe lurking in the shadows under the Hope Blvd culvert connecting Schlitterbahn with the Lake Madeline Channel. Watching the mixed species group of wading birds pictured above as they collaboratively fed in the slough near the mulch pile area. The Snowy Egret shuffling its yellow feet in the muddy water to spook prey items off the bottom, while the Tricolored Heron did a chaotic dance to chase down its breakfast. All the while, the quartet of White Ibis probed their foot-long curved bills into the marsh mud looking for tasty invertebrates. We should all take note how these different species can all peacefully co-exist in the same place at the same time, each deriving sustenance without adversely affecting those around them. It struck me that 2018 was a year of awakening for me with regards to birding, with a tremendous amount of observational learning both in the field, through books and helpful colleagues. 2019 seems to be starting off with a more mindful awareness. Removing the competition aspect of attaining a year-long species total has given me more personal freedom to enjoy the birds I’m watching. 2019 should be less birdy for me: a promise I made my family as we moved out of the “Year of the Bird”. I’ll continue to do weekly property surveys and will work on building a cache of photos to document the diversity that the Moody Gardens property supports. 2018 ended with a total of 210 species seen here on Moody Gardens 240-acre property. We also tallied 138 species at the 170 acre Golf Course property with 14 being novel to the main Moody Gardens surveys, yielding a grand total of 224 species for the 410-acre year. There were a total of 290 daily surveys of Moody Gardens and 26 episodes of “chasing birdies” at the Golf Course. According to the eBird data for the Moody Gardens hotspot, we boosted the site total from 190 up to 249 over the course of 2018. Clayton Leopold, a fellow Moody Gardens biologist, was responsible for adding 10 of those new species. As an excellent birder, he texted me with updates and hints throughout the year when new migratory species showed up, or oddities were present. Fellow Island birders Mort Voller, Alice Anne O’Donnell and Jim Stevenson provided valuable guidance in species identification. Galveston Island Nature Tourism Council’s Executive Director, Julie Ann Brown, helped spread the word about this project to the broader nature tourism community. Clayton, Mort, Alice Anne, Jim and Julie Ann were on my group emails when I nailed some exciting new species or had a particularly cool day birding. David Sarkozi and Mike Austin provided guidance on species identification as eBird reviewers. They caught several mistakes in photographs I’d submitted and requested additional information for species IDs that were rare or needed better descriptions. Greg Miller (of “The Big Year” fame) provided motivation to finally pursue this project after many years of toying around with the idea. Ultimately this project will yield a book to showcase the avian diversity that the Moody Gardens property supports, including those more exotic species that are in our care in the Rainforest, Aquarium and Conservation Education programs. A property map showing the various hotspots where migratory and resident birds tend to be seen, accompanied by a species ID reference will also evolve from this 410-acre year. We also intend to look at the species’ use patterns and provide habitat improvement features to benefit the birds, and viewing improvements to benefit the birders. It was fitting to add #209 with Alice Anne O’Donnell’s Christmas Bird Count group and then finish out the year birding with Jim Stevenson and check off #210. Thank you both for your mentoring through this process. Here’s to a birdy 2019! The Birds of Moody Gardens – Merry Christmas! As 2018 “Year of the Bird” winds down I am formulating a plan to deal with all the data I’ve generated through the year with the Moody Gardens property surveys. Several things happened in the past week that remind me of the value of citizen science in understanding how and where birds live their lives. First and foremost was participating in the 41st annual Galveston Christmas Bird Count. CBCs as we birdnerds call them have been performed across the United States for 119 years. The Audubon Society oversees the CBC efforts and compiles the data from thousands of 15-mile diameter circles across the United States. Each circle has a CBC manager that organizes a team to conduct a one-day survey between 14 December and 5 January that creates a snapshot of bird abundance and diversity. Galveston Bay has 5 different CBC circles around it’s perimeter with 11 throughout the Greater Houston area. Galveston’s CBC was conducted on Tuesday, 18 December with more than 50 volunteers participating in teams counting 8 different areas within our circle. The Galveston circle is centered just west of Pelican Island encompassing areas on the mainland including much of Texas City, Virginia Point, Bayou Vista, Tiki Island, West Galveston Bay, North and South Deer Islands. Here on Galveston Island, the perimeter of our circle encloses all of Sportsman’s Road and Ostermeyer Road, transecting the beach at 8 Mile Road. Surveyors scan the Gulf waters all the way east on Galveston and across the Bolivar channel to Rettilon Road. The West End of the Bolivar Peninsula includes the Bolivar Flats Shorebird Sanctuary, Horseshoe Marsh and town of Port Bolivar. The remaining arc encloses a large expanse of Lower Galveston Bay including the Texas City Dike and Skyline Road with a large area of the Lower Bay’s Western Shoreline. According to Richard Mayfield, our Galveston CBC compiler, we typically see about 160 different species of birds, with a high of 175 in 2011 and a low of 144 in 2009. At the end of the CBC we assemble at a restaurant to recover from a day of slogging through marsh mud and prairie thickets for a fun and well deserved refueling and data download. This year’s count was particularly enjoyable as we were treated to a great meal in a nice location at Fisherman’s Wharf. 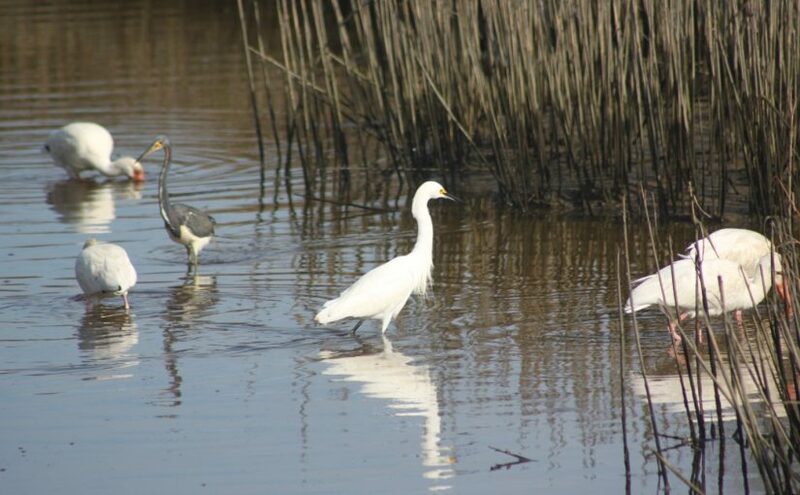 The Galveston Parks Board and the Convention and Visitor’s Bureau have taken the initiative to elevate Galveston’s birding activities to higher prominence in the City’s nature tourism story. They graciously hosted this year’s meal and those of us that made it back from the field in time to take in the sunset and the great food they provided thoroughly enjoyed the camaraderie of ticking off species as we read through the list. Data is still being compiled with a few write-in species making their way through the approval process. Preliminary numbers suggest an average year with somewhere between 150-155 species for 2018. If you are interested in joining us in 2019, the count will be on Tuesday, 17 December from dawn till dusk. We gladly take volunteers from novice birders to experts to help us see, identify, count and record all the birds we see across this 177 square mile area. We would be particularly interested in folks with boats that are large enough to comfortably host perhaps 6 people while being shallow draft enough to navigate the Bay shoreline. The second example of citizen science data sharing came in the form of a picture taken by one of our Moody Gardens employees enjoying his newly acquired camera lens. Dusty Durbin took the photo of the Osprey above at 8-mile Road and Stewart Road. A relatively common bird here on the Island through the winter, he noted that this one had bands on its legs. Using the network of colleagues that readily provide advice, we were able to get this photo into the hands of a wildlife biologist at St. Cloud State University in Minnesota that recognized the colored and numbered bands as those he’d applied to a nestling in July 2015 on the bank of the Yellowstone River in Montana. This bird, 41/C, was photographed and identified here in Galveston in January 2016, strengthening the researcher’s observations that these birds are surprisingly site faithful in their winter habitat. Citing another local winter bird, 10/B that spent 4 winters on the same tree in Seabrook, the researcher has since been able to identify its nest site in Montana. The observations of people in unrelated pursuits in distant areas over several years successfully connected the natal nest site, winter site and adult nest site for this bird. Using birdwatching as an excuse to spend time outdoors is a complete reward on its own. Taking the extra step to record your observations from simple lists, through photos, videos and recorded calls adds value. Providing that data to untold numbers of researchers compiling census trends, identifying shifting ranges and altered phenologies or localized extirpation events is critical to understanding how the natural world works and is changing around us. I would encourage anyone that spends time outdoors looking at birds to consider putting those observations on eBird for others to see. I also hope everyone is enjoying this holiday season in whatever tradition you hold dear. Peace. Posted on December 27, 2018 Author Moody GardensCategories UncategorizedLeave a comment on The Birds of Moody Gardens – Merry Christmas! 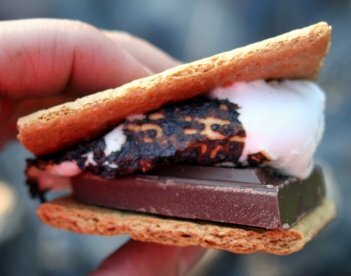 Posted on November 27, 2018 Author Moody GardensCategories UncategorizedLeave a comment on In the Moody for Delicious Food! The Birds of Moody Gardens – A lot to be Thankful for! 2018 has been a year of surprises as I’ve been much more aware of the bird activity that surrounds me. For me and this 410-acre year project, it truly has been the “Year of the Bird”. I’ve had several chance encounters with unique bird species that were likely there in years past, but I simply wasn’t looking at what was around me. In early November there was a weather pattern that essentially created a fallout of southerly migrating species here on the coast. The Arctic blast that pushed south across the area on 9 November brought with it a number of bird species that had not been seen very readily through the fall. The warbler diversity seen on the Island between 10-14 November was impressive with 10 species seen here on property over that long weekend. Species included; Black-and-white Warbler, Tennessee Warbler, Orange-crowned Warbler, American Redstart, Magnolia Warbler, Bay-breasted Warbler, Blackburnian Warbler, Palm Warbler, Pine Warbler and Yellow-rumped Warbler. I also encountered Summer Tanager and Scarlet Tanager as well as several Golden-crowned Kinglets alongside the expected Ruby-crowned Kinglets. Perhaps the most unique sighting was the Brown Creeper pictured above, which was officially my #200 property species on 10 November. Since then I’ve added Hermit Thrush, Western Meadowlark, Golden-crowned Kinglet, American Goldfinch, White-crowned Sparrow and American Robin for 206. I did 2 surveys at the Golf Course during this same 4 day period and increased that property total to 134 for the year with Ross’s Goose and Redhead bringing the combined 410-acre year total to 221 species! 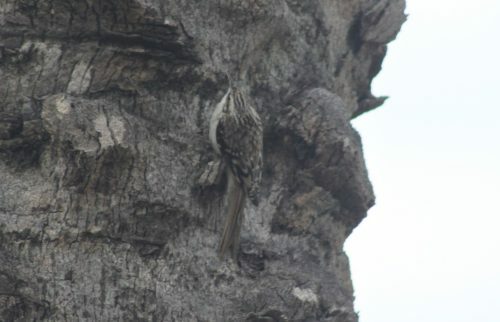 The Brown Creeper pictured above is a rare Island visitor that was blown south with the strong frontal winds leading into that weekend. These cryptic insectivorous birds use their long toenails to grip and their stiff tail to prop themselves up on tree trunks as they probe the crevices in the bark with their long curved bill searching for arthropods. My encounter with this species could not have been more random and lucky as I was returning to work to search for Golden-crowned Kinglets and happened to see this little guy zip across the road in front of my car and land on the palm trunk immediately to my left. It was accommodating as I tried to be as calm as possible while I stopped the car, turned down the radio, rolled down the window, grabbed my camera and snapped off several pictures of this gem. It worked up the trunk in a characteristic spiral movement allowing me to get several great images. Having a species that only shows up on the Island every 5 years offer me this great opportunity to see, identify, photograph and observe behavior was truly amazing. 2018 is the Year of the Bird – get out and enjoy it! Posted on November 27, 2018 December 6, 2018 Author Moody GardensCategories UncategorizedLeave a comment on The Birds of Moody Gardens – A lot to be Thankful for! 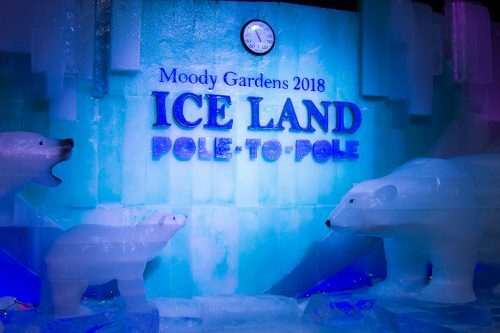 Moody Gardens Welcomes Ice Carvers to Create Pole-to-Pole Journey! 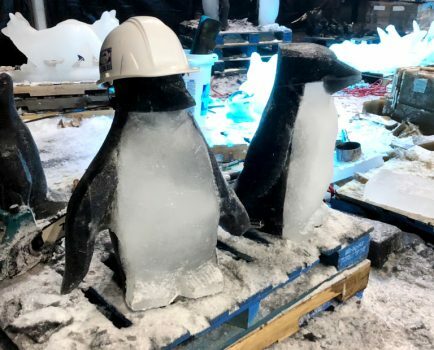 After traveling halfway around the world, a team of internationally-acclaimed Chinese ice carvers made their way to Galveston’s Moody Gardens to create holiday and animal themed sculptures from two million pounds of ice. The team of 25 master carvers will spend the next few weeks sculpting ordinary 300-pound blocks of colored and clear ice into works of art and more as they create ICE LAND: Pole-to-Pole, opening November 17. This year’s ICE LAND theme takes guests on a journey from the North to South poles. 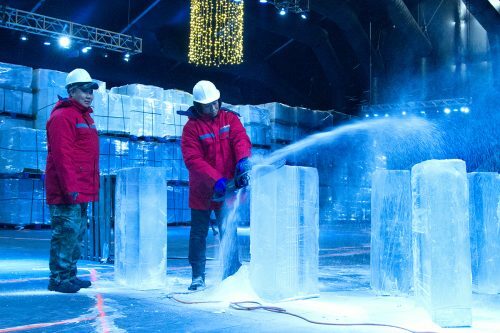 The CAA Ruijing Ice Carving Team will even create a giant ice slide that will take guests on a glacial journey. Guests will encounter polar bears, penguins, humpback whales, snowy owls, walruses and of course, reindeer – all hand-carved out of two million pounds of ice inside a 28,000 square foot insulated tent structure chilled and maintained at nine degrees. Shiver’s Ice Bar also returns to ICE LAND this year for guests to enjoy ultra-cool holiday spirits. ICE LAND: Pole-to-Pole will be open from November 17 through January 6. Guests who want an ultra-chill behind-the-scenes look at how ice carvers transform two million pounds of ice into the towering, colorful sculptures seen in the finished ICE LAND can sign up for the exclusive Ice Carver VIP Experience offered daily through November 10 from 10 a.m. to 1 p.m. The $199 package allows guests access to see the ice carvers in action. Guests will also go behind-the-scenes at the Aquarium Pyramid to meet a real penguin and enjoy lunch with the Ice Carving Team. Advance reservations are required and can be made by calling 409-683-4375. For more information on ICE LAND, or any other Moody Gardens’ holiday attractions, call 409-744-4673 or click here. 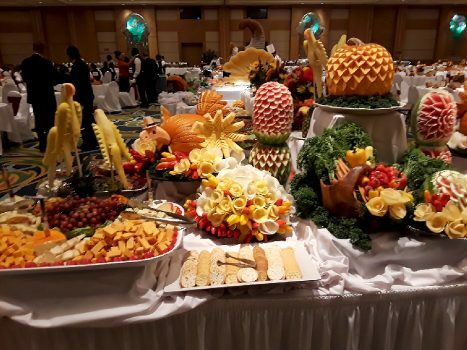 Posted on October 24, 2018 Author Moody GardensCategories UncategorizedLeave a comment on Moody Gardens Welcomes Ice Carvers to Create Pole-to-Pole Journey! Click here to watch Moody Garden’s official statement video. An expedition to Florida to support an ongoing research project has resulted in an organized campaign against Moody Gardens and Texas A&M University Galveston with allegations of improper conduct by our professional staff. We take these allegations very seriously and wish to address these public comments and correct misinformation that has been presented as fact. We have been working with several public aquariums and university research programs including Texas A&M University Galveston to improve sustainability within our living collections for the past three years. Captive breeding in marine fish is an important initiative within the Association of Zoo and Aquarium (AZA) community and we have been focused on several species of Blennies in its work. The biologists were in Florida to collect broodstock for these breeding efforts for those species with which there has been success and a few others that show promise. Moody Gardens limited its collecting efforts to species that do well in human care and can help us tell the story to our visitors of zoos and aquariums helping to save species. After three decades of battling evil and exemplifying teamwork, the beloved Teenage Mutant Ninja Turtles (TMNT) have made their temporary home in an exhibit in the Moody Gardens’ Discovery Pyramid. 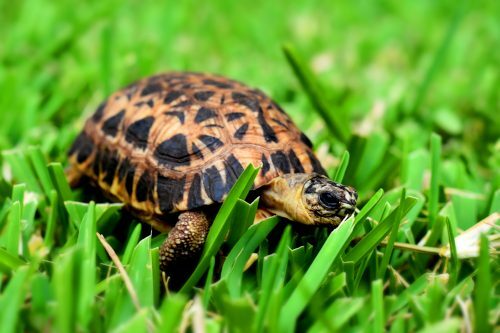 The exhibit features a live turtle aspect to shine a light on turtle wildlife conservation. 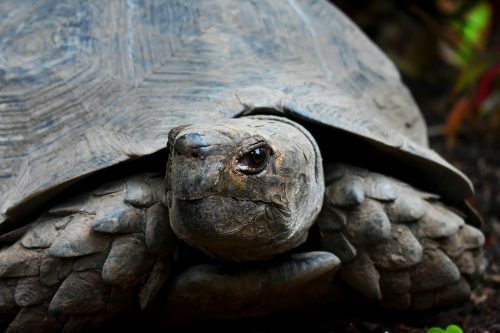 The turtle species that will be featured in the exhibit will be the Spider Tortoise, Radiated Tortoise, Fly River Turtle, Burmese Mountain Tortoise and the Sea Turtle. This part of the exhibit will highlight ways to forge a future for these animals and bring awareness to factors that disrupt their natural habitats. Just by visiting Moody Gardens you are doing your part to further the conservation of these species. As a member of the Association of Zoos and Aquariums (AZA), Moody Gardens works with conservation groups around the world to fund research on species and their habitats. The more we know about an animal’s life cycle and environment, the better we can protect them. 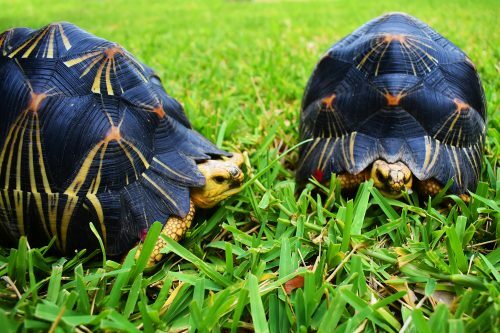 When you visit an AZA member institution, you help fun research and conservation efforts for animals, including turtles, all over the world. Want to do more? Here are some simple ways you can help! Reduce the amount of trash you create when you visit the beach by carrying reusable bottles, straws and bags. Join a beach cleanup crew. If you see a turtle on the beach make sure to call in the specialists at 1-866- Turtle-5. Conserve resources such as water, food or energy which gives the environment the time it needs to recycle. 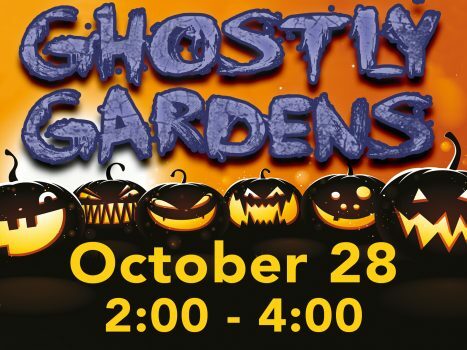 You have enjoyed trick-or-treating and the kid’s costume contest at Ghostly Gardens for years, and this year Moody Gardens has expanded the tradition to include two special activities to stir even the most unshakeable adults. The “Reignforest of Terror,” also on Oct. 27, takes guests on an after-hours theatrical tour through the Rainforest Pyramid that highlights the scary truths animals face in the wild. This event is also strictly for audiences 18 years of age and older. Tickets are sold on a first-come, first-serve basis by time slot for $25 per person and $15 for those with annual memberships. Tours start at 6 p.m. and are scheduled every half hour with the last tour starting at 8:30 p.m. wit participant check-in required 15 minutes prior to the tour. This year’s ticket sales support ocelot conservation. It’s a family affair with activities for the kids on Oct. 28 with the annual Ghostly Gardens celebration. Children and their families can participate in free trick-or-treating throughout the Moody Gardens property, Creepy Crafts, face-painting and other fun activities from 2-4 p.m. The event will also include a kid’s costume contest for children 12 years of age and younger. Prizes will be awarded to the participant with the best costume in each of the different age groups. The costume contest will kick off at 3 p.m. in the Gardens Lobby of the Visitor’s Center. All guests are encouraged to dress up in their favorite costume on Oct. 28. Families with at least on member in a Halloween costume will receive a special discount to the Rainforest Pyramid, SpongeBob SubPants, Discovery Museum, MG 3D Theater, 4D Special FX Theater and Colonel Paddlewheel Boat, paying just $5 per attraction per person. For more information or to purchase tickets to the Night Terror Film Festival or The Reignforest of Terror, click here.